Olympia is the birthplace of the Olympic Games, long the athletic pride of Greece. Today, Olympia is an outstanding archaeological site. 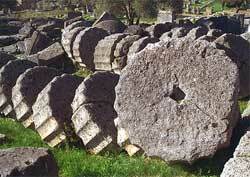 They were launched in Olympia on the Peloponnesus Promontory of Greece in 776 BC. They continued for over 1000 years until the Emperor Theodosius I banned them in 393 AD for their pagan attributes. They then remained dormant for 1500 years until they were revived in Athens, Greece in 1896. They were not allowed to participate or even view the Olympic Games. Violators were thrown off a mountain. Over the centuries the splendid Olympia structures became ruins because of earthquakes, fires, plundering and other calamities. Neglect also played a role. The Olympia structures were discovered in the 18th century. The fact that silt from floods gradually buried the crumbling Olympia buildings helped preserve them.